One of the biggest rock bands of the 1980s, 90s and beyond, Ireland’s U2 have become a brand, and the band’s singer, Bono, has evolved into a major political figure. They’re also among the growing number of groups aware of the increasing prices of rock memorabilia, and have become quite possessive of theirs. 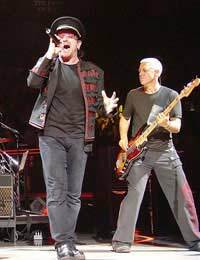 In 2006 they successfully sued to stop a former band stylist selling two items of stage clothing that had belonged to Bono on eBay. It was a case that raised ire on both sides. To the band, it was theft of personal property for gain. To those who might have bid, they felt cheated of the opportunity to buy these things – and, besides, it wasn’t as if the band needed the money. The issues at stake, however, are much bigger. Does a band own its memorabilia? In a way, the court answered yes. Unless a personal item is given to someone else, then it remains the possession of the owner. But the other things, posters and so on, can be something different. However, all this is part of a larger movement – in late 2006, several bands filed a lawsuit against the web site Wolfgang’s Vault, which had bought memorabilia belonging to the late Bill Graham, claiming it was infringing their “intellectual property” by selling these items. They might be litigious, but there’s still plenty of U2 memorabilia on the market. You can buy signed guitar and basses; indeed, autographed items are in demand, with a band-signed copy of The Joshua Tree snapped up at £240. A U2 book autographed by Bono went for £75, with a photograph signed by the band for £125. There’s a demand for promotional items, like an inflatable lemon from the 1997 Pop Mart tour for £95, umbrellas for double that, or triple the price for a 'Best Of' umbrella advertising their 'Best Of' release. You can also find quite a number of awards discs, both in-house and certified from various countries. The former sell for around £400, with the latter going in the region of £700. Considering their stature, that’s not too expensive; instead it reflects typical pricing for awards from the era, which have yet to really rise in price. Tour itinerary books and scripts (for the Zoo TV broadcast) are quite rare, going from £125-225. You can find some U2 items on eBay, but for the most part those are the lower ticket items. As a memorabilia band, U2 are in transition. They’re really too big for eBay, but not yet iconic enough to warrant sales through the major auction houses. That means, for the moment, they’re the province of the dealers. The prices might be a little inflated, but that’s the nature of the market, and they do offer items that you’re not going to find elsewhere. Of all the bands to break through in the last 20 years or so, U2 are one of the leading candidates for memorabilia investment. Their rise to the highest level seems almost assured. The biggest question, really, is how long it will take before prices begin to rise sharply. The better the item you buy, the more likely it is to increase in value – a few hundred pounds now could turn into a few thousand in time. The best things are the more personal items, but in the wake of the 2006 suit, those are few and far between (and the suit alone will mean they’ll rise in price), so if you can afford, buy them! @dublin7Guy. Wow is all that true? Bono acts as if a saint. Then why "break a butterfly on the wheel" by suing his band's stylist for selling tour clothing in e-Bay? Isn't there something about turning the other cheek - instead of suing a woman for teasing a Bono about his weight problems? A band member was caught out in a lie (or serious memory failure): he testified he never would have given away his boots because they held sentimental value. Then the boots were produced AND THEYD BEEN AUTOGRAPHED TO THE DEFENDANT BY THIS SAME BAND MEMBER. At that point any responsible judge would have dismissed U2's lawsuit and awarded costs to the poor defendant. But not in Ireland - where truth is not as highly valued as U2. THE JUDGE RULED FOR U2 despite this possible perjury. He could have reported this possible crime to authorities. On a Dublin bus tour the tour guide said Bono - who already has a multi- million euro home - was buying a neighbouring house AND TEARING IT DOWN SO HE WOULDN't BE OVERLOOKED. Tearing down a home in a town with a big homeless problem. Isn't there something about housing the homeless? "Everyone wants to organise their tax affairs efficiently," I heard The Edge say. Hardly rock n' roll talk. Yes Bono does good things - he donated tour earnings to charity. But some of his actions are hypocritical.